Generally, when you undergo either natural or commercial treatments, it needs time to work on hair follicles, rejuvenate them and achieve thick hair. You cannot expect the results overnight but once the root cause is fixed, the results stay for a longer period of time. There are several long-term strategies for treating hair loss and prevent breakage. Examples are Aloe Vera, Apple Cider Vinegar, Eggs, Onion Juice, Natural Oils, Biotin Supplements and Coconut Milk. But meanwhile, in some situations like when should head towards a party, attend an important meeting or going on for a date, you don’t have to cover it up with a cap or scarf – Hair Loss Concealers can be your friend in need. Hair Loss Concealer is the trending way of covering the thin hair and bald patches in just a minute….Isn’t that comforting! 1 What are Hair Concealers? 4 How to Choose the Right Hair Concealer? 5 Which Materials Should a Hair Loss Concealer Contain? 6 How to Use a Hair Concealer? Hair loss concealers are the quickest ways of improving hair texture and thickness in just a minute without any surgeries, drugs or chemicals that can be very dangerous. There are different types of hair loss concealers – sprays and fibers (sprinkles or powder solids). They also come in different colors, shades and textures. If you can choose a right product for you then being stylish isn’t that hard. Sprays: Hair concealer sprays are very easy for application and efficient in covering the bald patches. They contain colored dyes which spread on the scalp leaving fuller appearance. The disadvantages of these products are – they look artificial if improperly applied or applied in a hurry. Their resistance ability to heat, wind, water and rain are quite questionable. Hair Fibers or Sprinklers: These products contain micro-hair building fibers. When applied, these fibers get attached to the hair like tiny magnets to the existing hair. They contain static magnetic electricity which binds them to the hair strongly. These products are available in powder form which should be applied generously to get a fuller and thicker appearance. Their resistance ability to heat, regular wear, rain drizzles and wind is much better than sprays. They can be easily removed by washing the hair with shampoo. When it comes to thin hair and bald patches, there are several ways to cover them up. 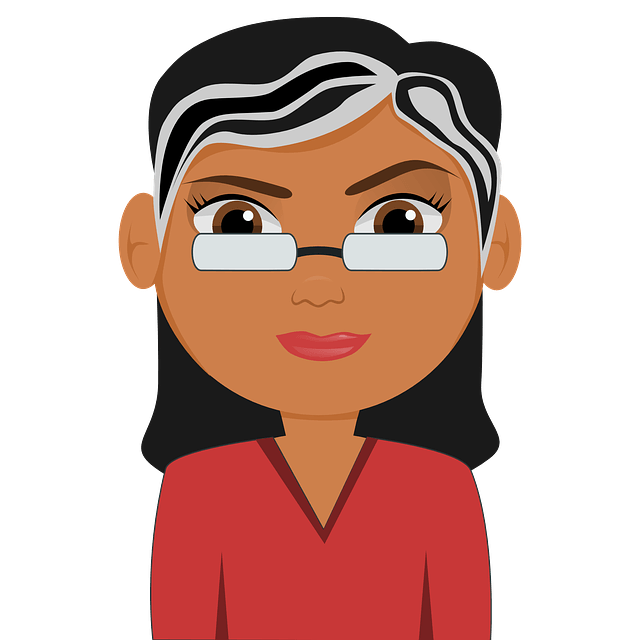 Below, let me explain some of the benefits of hair loss concealers over other commercial treatments like hair transplants. They help to cover up hair thinned areas and bald patches within a short period of time without prohibiting the hair follicles form growing. It is an affordable alternative when compared to hair transplants which usually are very time taking, tiresome and expensive methods. Concealers come in different styles and colors to choose from that include gray, dark brown, medium blonde, black, medium black, white and many other shades. They naturally blend into existing hair preventing unnatural looks and unnecessary attention of others at parties or any other get-togethers. They can be easily removed by just washing your hair with shampoo without any hassle. How to Choose the Right Hair Concealer? For effective results and to avoid embarrassment, it is very important to choose the right concealer. We have provided important things you have to consider while purchasing a hair concealer. It looks really embarrassing when the hair concealers and your natural hair don’t blend in. It unnecessarily creates an attention of others leading to humiliation. So, it is better to look out for products that contain fibers that easily blend in resembling like natural hair. No one likes to have fussy products that take time or have complicated procedure for application. Applying hair concealers should be easy and quick. The manufacturer should provide a detailed step-by-step description that clearly presents on how to apply the hair concealer. Choosing the right color matching your existing ones will provide a natural finish. Hair concealers are available in a variety of color variants but the most popular ones are blonde, light blonde, grey, black and black brown. Which Materials Should a Hair Loss Concealer Contain? The ingredients present in any product can have impact on your health which includes hair concealers as well. So, it is very important to know about the materials that are used in the product. We have provided some important things to check before buy a hair loss concealer. This is most appropriate and safe material to use on your head. The real hair fibers present in hair concealer can do the trick of covering your baldness and easily blend into your existing hair. No one else can understand the difference between your real hair and concealer as they are natural. If you want to cover the bald patches and areas with very thin hair then keratin fibers is the second best option. Because our hair is also made up of keratin, it can easily blend into the existing hair without leaving any artificial appearance. This should be you least option while looking out for an effective hair concealer. As per our recommendation, it is better to avoid hair concealer products with this material. Because the hair structure of animals is different from ours. The application of these materials has potential risks of allergies and irritation. How to Use a Hair Concealer? There are different ways of using a hair loss concealer depending on the product you have chosen and materials it contain. While using this product, you have to shake the bottle well and spray few times on the bald patches. You don’t have to mix up the ingredients and heat any solution. It is just spraying a perfume of deodorant. While using this product, you have to just pat it on the areas you want to get covered. It is important to make sure that the hair is dry before applying the product if you want to evenly cover the areas. Also make sure your hands are dry and wash your products after application. You have to sprinkle the contents of the product onto the areas you want to be covered. Due to electrostatic property the content gets attached to the present thin hair and provides full coverage. We understand, you haven’t go time to check out all products. That is why, our research team has tested various hair concealer products available in the market. And finally, picked up the best 10 after judging them based on the above mentioned features. You can have a look at them below. Though it is priced at premium, but if you are looking a standard product, this is it. 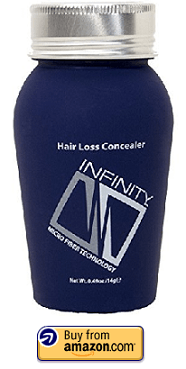 This product is one of the well-known hair concealers in the market. The fibers present in this product are made up of natural keratin proteins which always have a natural static change. The fibers are dispersed into the hair using a shaker bottle. This perfectly blend into the thin hair follicles make them look thicker and healthy. They can be easily removed with water and shampoo. The Toppik Company claims it to be water, perspiration and wind resistant. It comes in 9 different colors – medium brown, black, white, grey, light blonde, auburn, dark brown, light brown and medium blonde). It has been rated highest reviewed hair fiber brand on Amazon.com with 2,476 reviews. The application stays intact for a longer period of time. The keratin fibers of this product are made from organic protein similar to human hair. These fibers are charged with electrostatic energy which helps to bind to the thin hair immediately. As per the manufacturer, these fibers work best on people with 1 – 1 ½ inch long hair. As per the user reviews, this product is very easy to apply. For best results, you have to pat down the hair fibers after applying them to the hair which helps them to settle down. Using a hair spray after the application helps to hold them for a longer time. It comes in 4 different colors – light brown, medium brown, dark brown and black. A bottle of CUVVA keratin fibers may last between 60 – 75 days which usually depends on usage. The brand backs up a 30 day, no hassle money back guarantee. XFusion keratin fibers blend undetectably with existing hair strands and instantly create the appearance of naturally thick and healthy hair. These fibers are made up of keratin protein that is similar to the human hair. This product is great for covering extension tracks and touching up the roots between hair color appointments. The company claims that this product can enhance even sparest areas of the head. It is available in 8 most common colors – medium brown, dark brown, medium blonde, auburn, black, gray and others. The keratin fibers of this product are made from the plants (Moroccan Gossypium Herbaceum and mineral based colorants) which are safe for even the most sensitive scalp. Once you apply the caboki hair loss concealer, your hair will instantly look fuller, thicker and eliminate those embarrassing thinning hair areas. The fibers are unnoticeable even from a close up view and under the bright sun. They bond with the hair more securely without clumping on the scalp. It works best for both men and women. Once you pat the concealer on the head, the fibers present in it magically blend to the present hair and fill up the bald patches. Usually, it stays in place for 8 hours. If you want to keep the styled hair for more than 10 hours then this may not be your product. 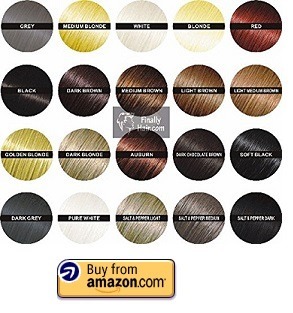 It comes in different colors from black, auburn, brown, blonde, gray and in-between shades. As per their official site, the manufacturer claims that it will just cost 50 cents for each application. This product contains the best and real keratin fibers. It doesn’t contain any cotton or wool fillers. Unlike most of the hair loss concealers, it is designed to be anti-clump which means it cannot moisture and get fat. For effective results, this product has to be used only on dry hair. Pat it well for a minute to get full and even coverage. Make sure to wash your hair after the application. For a long shelf life, close the lid after the usage. Unfortunately, this produce is not rain resistant. Manufacturer also states that it is clean-pillow formula which states that it hardly comes or stain the pillow if you slept with application. It comes in 20 different color shades which include grey, black, light medium brown, salt & pepper light, dark grey, black, pure white, dark chocolate, auburn, blonde and others. Anti-clump and clean pillow formula. Application bottle is easy to handle and use. If you suffering from very thin hair and want to cover up then this product is the best among them. The keratin fibers present in this product are made up of structural proteins which are charged with electrostatic electricity. It perfectly blends into the natural hair and binds strongly to the hair shaft. It works perfectly both for men and women. As per manufacturer, this process is perfect for people who don’t want to take propecia or rogaine medications for hair loss or balding. As the product contains powder, it keeps the bouncy, light and adds up volume. Stays intact in all day even in environmental conditions like rain, sweat and wind. Viviscal Hair Filler Fibers will provide an instant coverage for thin hair and make it look thicker in just few seconds. It comes with an easy-to-use precision comb applicator disperses the micro fibers which blend into the hair strands building density and creating a thick, full-looking head for hair. You can observe the difference almost instantly. If you want longer lasting results, then simply follow it by a hair spray. Though you get only 5 basic hair colors, they can be mixed to customize as per your hair color. This is one of the few brands that use wheat, soy and corn to mimic natural hair. As the materials are natural, they don’t have cause any irritation or other side effects. The manufacturer even provides 90 day money back guarantee. This product works entirely different from the hair fibers and sprays. It is one of the best hair concealers in the market as it provides natural looking coverage with its unique topical shading technique. Topical shading concealer refers to the compound colored concealer which is used to shade the thin layer to make it look thicker and fuller. Dermmatch is the only product where you can swim with it. If used correctly as mentioned by the manufacturer then you can hardly detect the difference even under the lighting. One disk of dermmatch lasts for 3 times longer than other types of hair loss concealers. Dermmatch should be applied by wetting the applicatory and gently applying the concealer on the affected areas in circular motions. You should only use distilled water for this process as regular water may contain elements that can reduce the quality of the product. It is better to leave the application for 5 – 10 minutes before styling your project. 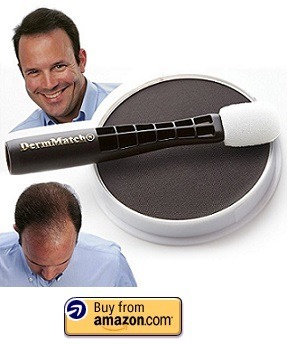 This product provides instant solution to the thinning hair for both men and women for all ages. The colored fibers blend undetectably into the existing hair which provides thicker and fuller appearance instantly. It covers the entire scalp in just 30 seconds. The micro fibers use static electricity and become electrostatically charges when the bottle is shaken. This strongly enables them to hold on to the hair all day long through wind, light and exercise. The colored fibers don’t run, stain or leave any marks behind. Hair Illusion contains 100% natural human hair without any added synthetic dyes. Its electro statically bonds to the hair and scalp providing an illusion of having a full head of hair. It takes only few minutes to completely change the look of your hair. The company claims that its product works on completely bald areas which means it doesn’t need any hair any cling unto. The company hasn’t referred to whether the application can stay in place even after exposing to wind, sweat or rain. For application all you have to do is shake the bottle and sprinkle on the hair. It comes in 9 different colors – auburn, brown, dark brown, jet black, light blonde, light brown, light blonder and others. The manufacturer even provides 100% money back guarantee with no question asked. Here are the side effects and disadvantages of using hair concealers. Make sure to go through them to be on safe side. If the material present in hair concealer is allergic to your scalp then it may cause irritation. So, it is better to patch test on a small area. Many dermatologists are afraid of phsycological effects of a hair concealer when used long term. If the fibers are inhaled for a prolonged time, then it can cause irritation in the lungs. Although covering up is easy, it takes time and attention to carefully execute the procedure. Most of the users feel self-conscious about being found out or getting caught outside in the bad weather. Remember that hair concealers are only a temporary solution to cover your thin and balding areas. They don’t stimulate the growth of new hair. If it is not restoring the true confidence in you then seems counter-productive of its use in our opinion. But finally, it is the individual’s decision to use it or not. Do you know any other product that works better than the above mentioned? Click Here to learn more about natural home remedies to treat hair loss. Share your experiences, suggestions, and queries in the comment section below.